Imagine if you could go back in time to sample some of the food that our predecessors once ate. That’s what guests experienced as they celebrated 150 years of the Adelaide Central Market. As part of Tasting Australia, we experienced A Time Traveller’s Feast; a culinary journey filled with intricate stories covering four periods in the last 150 years. Our journey starts in 1869, where we are greeted by a stall serving freshly shucked oysters from Samtass Brothers Seafood with a dressing made by Chef Karena Armstrong from the Salopian Inn. The next stall provided hams, pates and other smallgoods from the award winning Barossa Fine Foods. The MC for the event was talented writer and author, Katie Spain, who guided us through the culinary experience and journey. 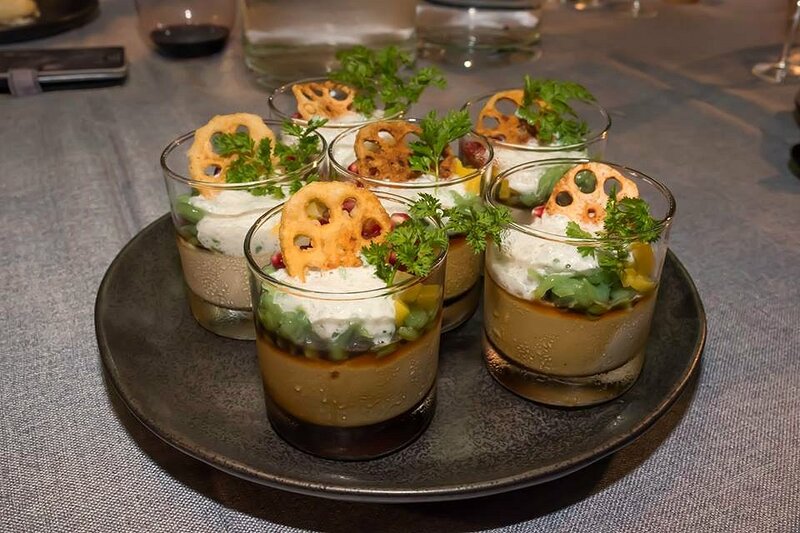 During this time, we were treated to some additional canapes created by Karena Armstrong. We then move to 1919, with dishes created by Chef Lachlan Colwill from Hentley Farm and Chef Tony Hart from the Intercontinental. Chef Lachlan served up Devilled Eggs and Salted Fish Salad. Sometimes the simple things in life are often the best, and we felt this dish was a great example of that. 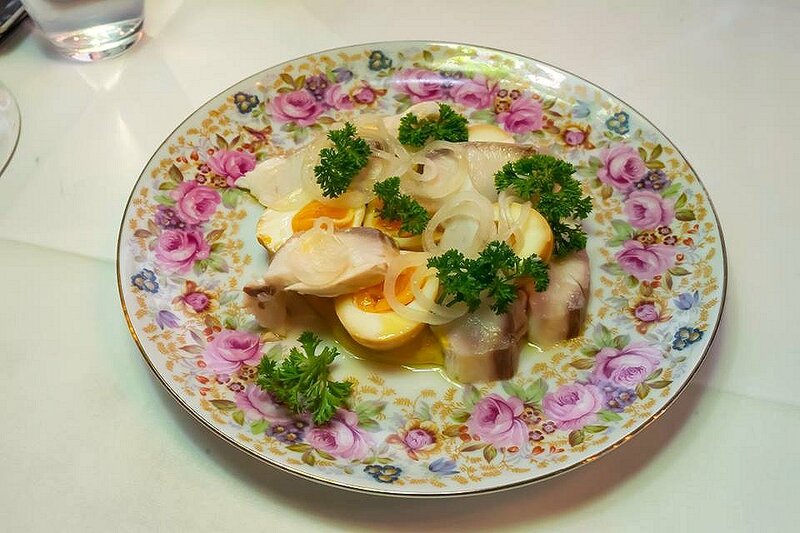 The fish was salty and smokey, and was balanced by the sweetness of the pickled onion. Chef Tony delivered Seared Duck Breast with caramelised carrot puree, candied walnuts, baby beets and quince glaze. 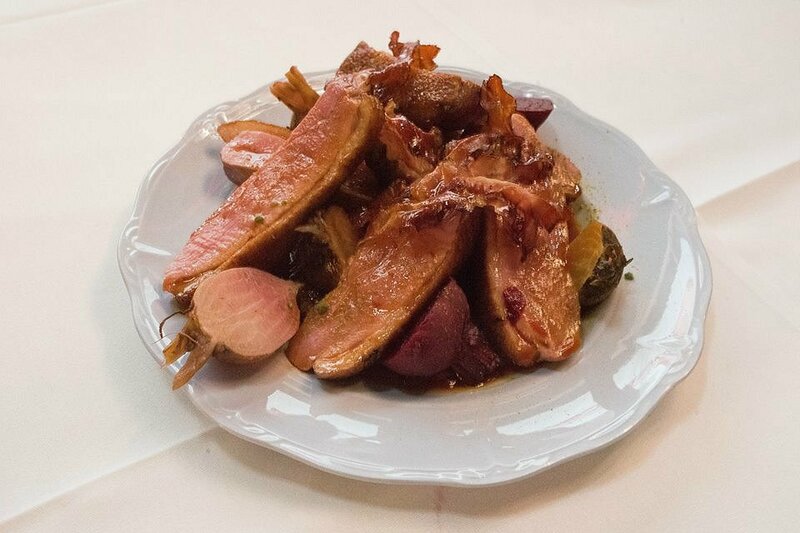 Generous slices of duck breast were cooked to perfection. Beautifully pink in the centre, each bite was juicy and succulent. The sweetness of the carrot puree and beets was balanced by saltiness of the crispy pancetta. The walnuts added a crunchy component to the dish. Fast forward half a century to 1969 with dishes created by Chef Jordan Theodoros from Peel Street and Chef Matteo Carboni of Casa Carboni. 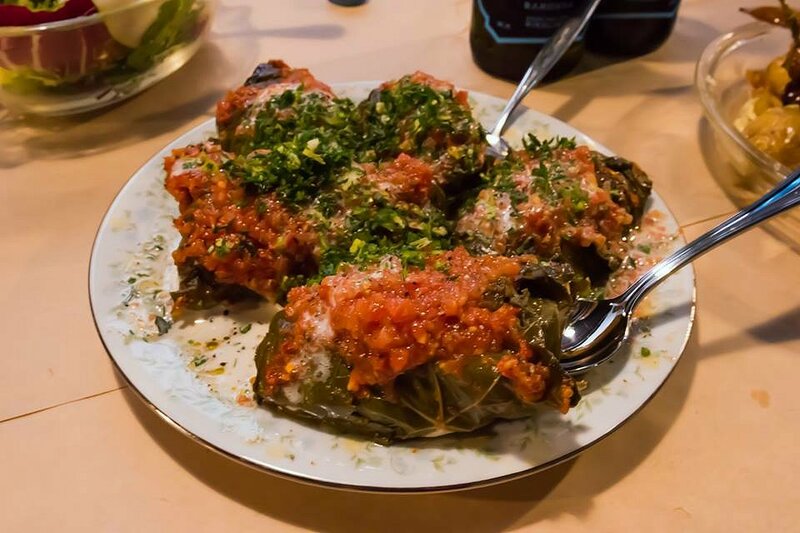 Chef Jordan served up Baked Fillets of Whiting stuffed with cracked wheat wrapped in vine leaves. From the initial appearance of the dish, we thought we were getting large dolmades. Hidden inside the vine leaves was layer of perfectly cooked fish sitting on a bed of crunchy cracked wheat. There was a sourness from the finely chopped tomatoes and slight peppery after taste. Not what you’d expect but incredibly delicious. 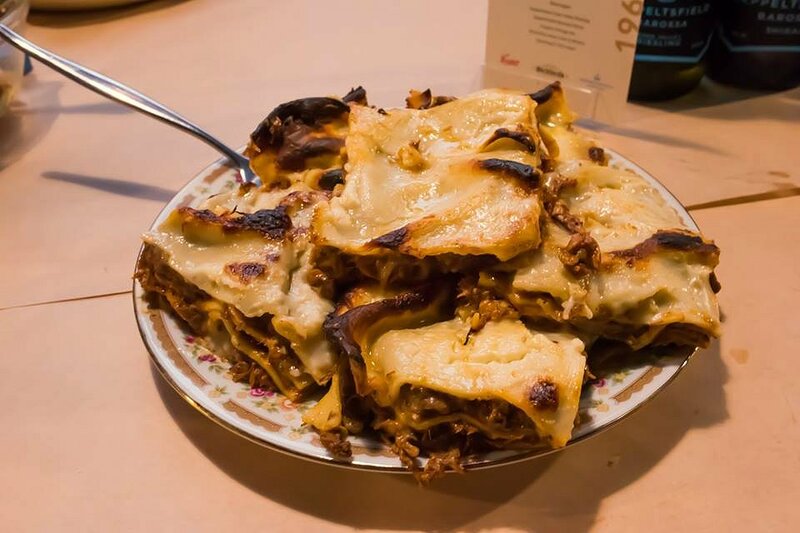 Chef Matteo cooked up a delicious Vincisgrassi Lasagne. Most guests agreed this was the dish of the day. Instead of the typical mince meat between the pasta sheets, there was a soft and delicate ragu. The meat was well seasoned and simply fell apart. Tomatoes are usually required for acidity, but we were getting that from the accompanying salad. Finally, we end up in present day 2019 with dishes from Chef Eddie Ye from Yakitori Takumi and Chef Brad Sappenberghs from Comida. 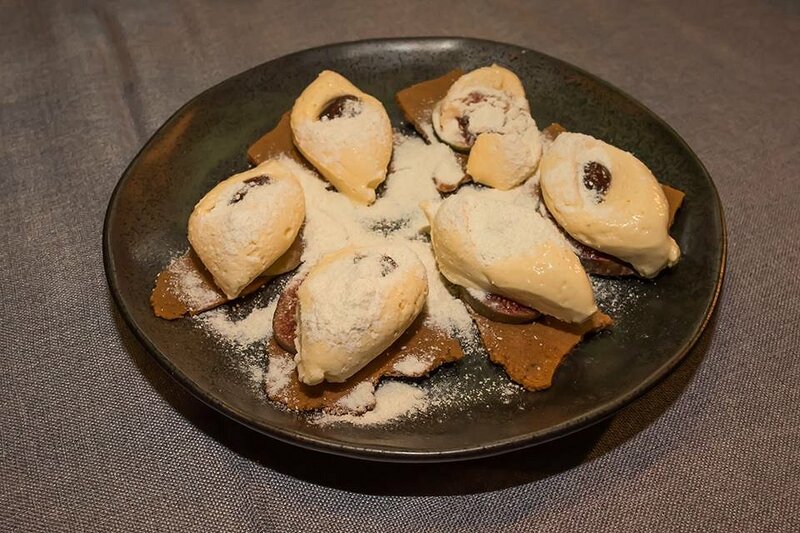 Chef Brad served up a sweet made from White Chocolate, Fermented Late Season Figs and Pedro Ximenez. Sitting on a bed of chocolate tuille is a decadent white chocolate mousse. Right in the centre is combination of pedro ximenez vinegar and reduced orange zest. Perfect for the adult sweet tooth. Chef Eddie put together a Coconut and Palm Sugar Panna Cotta with pandan jelly pearls. For those that don’t like it as sweet would enjoy this particular Asian inspired dessert. The panna cotta was thick and creamy, and there was plenty of natural sweetness from the jack fruit and pomegranate seeds. What an amazing experience into what people ate throughout the last century and a half. It was a pleasure seeing the period costumes, the attention to detail with the table settings, and listening to the personal stories of business owners and their specific food culture. Thank you to the Adelaide Central Market, all the participating guest chefs (Karena Armstrong, Lachlan Colwill, Tony Hart, Jordan Theodoros, Matteo Carboni, Eddie Ye, and Brad Sappenberghs), all the drink partners (Seppeltsfield Barossa, Bickford’s and Coopers), and all the staff involved. We will be excited to see what is in store for next year!